Dental disease is often overlooked by pet owners, but it can cause significant discomfort to your pets. If it is determined that your pet requires a dental cleaning after oral exam, we will schedule a day for you to bring your pet in for the procedure. We will run pre-anesthetic bloodwork to ensure that your pet is completely healthy and ready to go under anesthesia. You pet’s vitals will be monitored at all times during the procedure, and an inflatable heating pad will be used to keep your pet’s temperature regulated throughout. First, digital dental x-rays will be taken to check for any advanced dental disease or other hidden problems in your pet. Then the teeth will be professionally scaled on all surfaces. This is followed by a thorough polishing to clean off any remaining tartar and leave a smooth surface. How do you determine if an animal requires extractions? Sometimes an animal may have a tooth that is loose enough for it to be safe assumption that the the tooth needs to go. However, it is not usually apparent until a full, sedated oral exam can be performed and dental radiographs can be taken. Why do I have to put my animal under anesthesia to have its teeth cleaned? 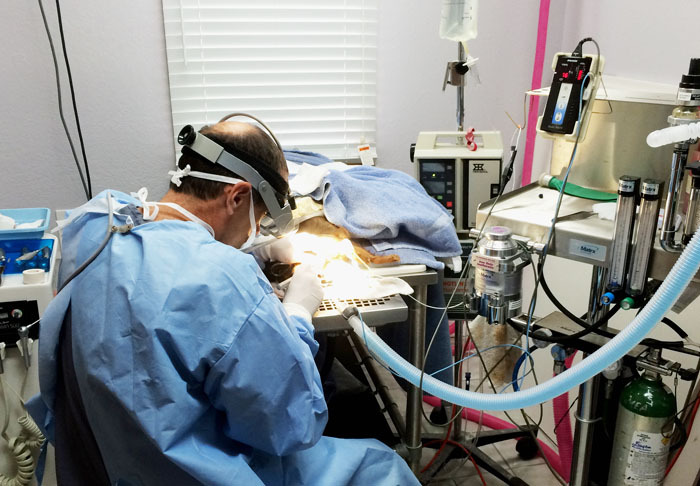 Dental cleanings are effective in treating and preventing dental disease because they remove tartar from both the visible surfaces of the teeth AND from the subgingival areas hidden under the gums. Hand scaling the teeth without anesthesia does not remove this hidden tartar. For more information about dentals without anesthesia, please visit the following page. What can I do to keep my pet from needing a dental in the first place? Some breeds are more prone to dental disease than others. Depending on your pet’s breed, diet, and habits, a cleaning may never be necessary. Other animals may accumulate tartar very quickly. For any pet, the best way to ensure that their teeth stay healthy without requiring a full dental is daily brushing. While this may seem like a lot of effort, it only takes three minutes of your (and your pet’s) day and it keeps their teeth healthy and clean. For demonstrations on how to brush your pet’s teeth paired with a full oral exam for your pet, please call Hunters Glen today.